In addition to eating my way through Tampa, I have also been enjoying the US shopping seen. Despite my amazing Lilly sale scores, I have mostly tried to focus on pieces that can transition into and work throughout the fall. I am loving all of the blush tones for fall, especially this bag, which is on sale! I also picked up this fabulous felt hat at Nordstrom, which looks just a much pricier Rag and Bone hat I had my eye on (also comes in blush). I also picked up some basic striped shirts, because you can never have enough stripes (especially when traveling), and this perfect v-neck cardigan. I love a great and versatile floral fluted skirt (it's just begging to be paired with stripes) and you can't go wrong with a comfy denim dress. My favorite purchases, however, are my army green field jacket, blush pleated skirt, and leopard d'Orsay flats. 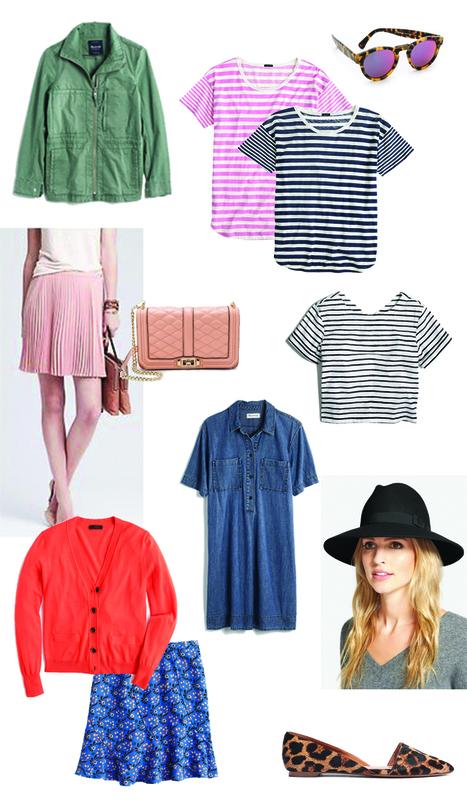 Shop all of my picks for fall below. What are your must-have pieces for fall?